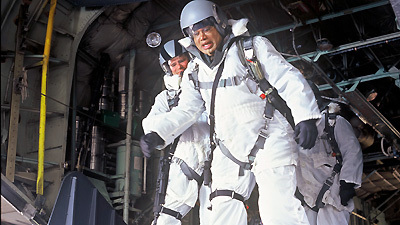 The stargate won't engage, and an investigation leads to the discovery of a second stargate in Siberia. The Russians had recovered the alpha gate from the floor of the Pacific following the destruction of Thor's Asgard ship, and had begun their own stargate program. Now, however, the Russian gate is locked open, inexplicably maintaining a perpetual wormhole to a planet submerged in water. Brilliant Russian scientist, Dr. Svetlana Markov, turns to the SGC for help, and SG-1 travels to Siberia in an attempt to shut down the gate. At the Siberian facility, SG-1 makes a horrifying discovery. All of the soldiers and scientists are found dead. A sample of the water, which had been retrieved earlier from the planet and found to have the amazing ability to emit energy, is missing, and the gate remains connected to the water planet, apparently drawing its power from the water itself. Dr. Markov, Carter, and Daniel travel through the wormhole in a miniature submarine, and are successful in shutting down the gate, but the water prevents the sub's return, and begins to crush it. Meanwhile, back at the facility, O'Neill and Teal'c discover the frozen body of Colonel Maybourne locked in a freezer. Even more astounding, as the body begins to thaw, Maybourne comes back to life, coughing up water, and bringing a dire warning. The water is alive. Having left Maybourne, the water enters Teal'c and forces him to dial the stargate. Now able to return to the planet, the water vanishes through the gate, just as Dr. Markov, Carter and Daniel are returned to the facility in what appears to be an improbable exchange of hostages. The original mission was to transplant the Enkarans to a new home world. An energy spike and corresponding seismic tremor indicate the activation of a second gate. The Russians recovered the alpha gate from the bottom of the ocean two months ago, after the crash of Thor's ship, and before their Foxtrot sub was lost. The DHD from Giza was confiscated from the Germans after World War II. They were set up in a decommissioned experimental power station on the Siberian Plateau, at 97 degrees E longitude, 72 degrees N latitude, near the Kuybyshev Airbase. Dr. Svetlana Markov, chief science officer and second in command to Colonel Sokalov, helped establish the Russian program against the wishes of powerful people in the government who wanted to expose the US program to force the sharing of technology. The program was in operation for 37 days and had explored 7 planets when the malfunction would not allow the gate to close. The Russians have access to extensive files on the SGC. Colonel Maybourne has been in contact with the Russian stargate program. The combination of the strong signal from the drone aimed at the event horizon, and the energy emitted by the water, maintained the connection and wouldn't let the gate shut down. A stargate cannot activate when buried, but it can engage under water. The wormhole only allows matter to travel one way, but radio signals can be transmitted both ways. A wormhole can remain active for a maximum of 38 minutes unless it is able to draw energy from an alternate source. The gate has the ability to use density, molecular structure, and the force being exerted on the event horizon to determine whether something is trying to pass through. The alpha gate supercedes the beta gate as long as the DHD is connected. If it is connected only when in use, it will prevent crossover to the beta gate. The water sample had unbelievable properties, spontaneously emitting energy in the form of heat. The heat was due to countless microscopic intelligent life forms in the water that are capable of entering and controlling a human body, and leaving it again. The Extreme Measures Protocol releases Substance 35, a non-persistent nerve gas, into the facility. Forty seven people at the Russian base were killed and 7 SG teams were trapped offworld by the gate malfunction. O'Neill has parachuted hundreds of times.